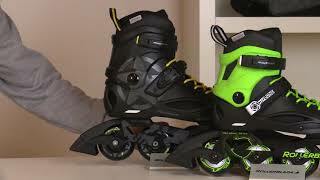 Cyclone is a great skate for kids who want a molded skate that is tough, maneuverable and fast. This skate is different because it provides a type of experience and performance that traditional skates cannot. Cyclone is adjustable two sizes with extra padding in the liner. The skate is shipped in the smaller size and if the child needs more room, simply remove the "Size Adjuster" in the liner's toe to create the extra room. This design system allows for true performance and fit. Bigger wheels and better bearings add speed. This is an ultra responsive, cool and versatile skate that kids will enjoy using. Brake is on the skate. 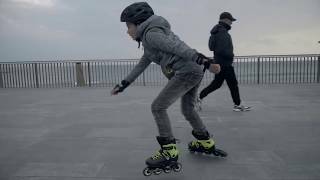 - BEST KIDS MOLDED SHELL The Cyclone is perfect for the kid who wants to experience molded boots and explore new styles of rolling anywhere and everywhere in this extremely versatile and durable skate.